New York Police Lieutenant Eve Dallas enters the Wilfred B. Icove Center for Reconstructive and Cosmetic Surgery on a case. A hugely popular vid star has been beaten to a bloody pulp. Before they can leave the building, another case falls into their hands. Dr. Wilfred B. Icove himself has been found dead in his office. Known as “Dr. Perfect,” the saintly Icove devoted his life to his family and his work. His record is too clean for Dallas. As Dallas follows her darkest instincts into the Icoves’ pasts, what she discovers are men driven to create perfection—playing fast and loose with the laws of nature, the limits of science, and the morals of humanity. Eve Dallas is one tough cop. But when Trudy Lombard shows up, it’s all Eve can do to hold it together. She’s plunged back into the days when she was a traumatized girl—trapped in foster care with the twisted woman who now sits in front of her. Trudy claims she just wanted to see how Eve was doing, but Eve’s husband, Roarke, suspects otherwise. Just a few days later, Trudy’s found on the floor of her hotel room, a mess of bruises and blood. Eve is determined to solve the case, if only for the sake of Trudy’s bereaved son. 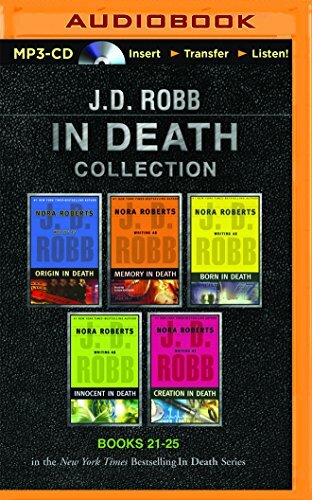 Unfortunately, Eve is not the only one to have suffered at this woman’s hands, and she and Roarke will follow a circuitous, dangerous path to find out who turned this victimizer into a victim. Technology has advanced in 2060 New York City, but childbirth has been the same since the beginning of time. And despite the brutal double homicide on Lieutenant Eve Dallas’s caseload, she has to be there for her pregnant friend Mavis. But Mavis needs an even bigger favor now. Tandy Willowby, one of the moms-to-be in her class, has gone missing. Mavis wants no one but Eve on the case—and Eve can’t say no. She’ll have to track Tandy down while tracing the deals and double-crosses hidden in the files of some of the city’s richest and most secretive citizens. But as she mines for the crucial data that will break the case wide open, Eve faces an all-too-real danger in the flesh-and-blood world. The death of history teacher Craig Foster devastated his young wife, who’d sent him off to work that morning with a lovingly packed lunch. Lieutenant Eve Dallas, of course, is more hardened to murder cases. It’s Eve’s job to get a feel for all the potential suspects, and find out why someone would have done this to a man who seemed so inoffensive. Now Magdelana Percell—there’s someone Eve can picture as a murder victim. Possibly at Eve’s own hands. The slinky blonde—an old flame of her billionaire husband, Roarke—has turned up in New York, and she’s anything but innocent. Unfortunately, Roarke seems blind to Magdelana’s manipulation, but not to her shapely figure and flirtatious ways. Eve knows all too well that innocence can be a façade. Keeping that in mind may help her solve this case at last. But it may also tear apart her marriage. Eve has seen this crime scene before: carved into the victim’s torso is the exact time it took her to die. And on the third finger of her left hand has been placed a silver ring. Eve is catapulted back to a case nine years earlier, to a man tagged “The Groom” whom Eve couldn’t stop before he disappeared. Now The Groom seems to have come back to where he started. With the Groom’s monstrous return, Eve is determined to finish him once and for all. Familiar with his methods, she knows that he has already grabbed his next victim. But his sights are set on the biggest challenge of his illustrious career. Time is running out on another woman’s life...and for Eve.